In the manufacturing industry, critical product characteristics get routinely collected to ensure that all products at every step of the process remain well within specifications. 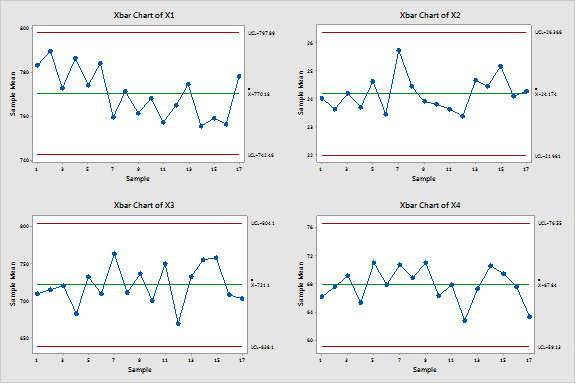 Dedicated univariate control charts are deployed to ensure that any drift gets detected as early as possible to avoid negative effects on the final product performance. Ideally, when a special cause gets identified, the equipment should be immediately stopped until the issue gets resolved. In modern plants, many manufacturing tools are connected to IT networks so that tool process parameters can be collected and stored in real time (pressures, temperatures etc.). Unfortunately, this type of data is, very often, not continuously monitored, although we might expect process parameters to play an important role in terms of final product quality. When a quality incident occurs, data from these numerous upstream process parameters are sometimes retrieved from databases, to investigate (after the fact) why this incident took place in the first place. A more efficient approach would be to monitor these process parameters in real time and try to understand how they affect complex manufacturing processes: Which process parameters are really important, and which ones are not? What are their best settings? Monitoring upstream tool parameters might lead to a huge increase in the number of control charts, though. In this context, process engineers might benefit from using multivariate charts which let you monitor up to 7 or 8 parameters together in a single chart. Rather than using equipment process parameter data to investigate the causes of previous quality incidents in a fire-fighting mode, this approach would focus on long-term improvements. Multivariate control charts are based on squared standardized (generalized) multivariate distances from the general mean. 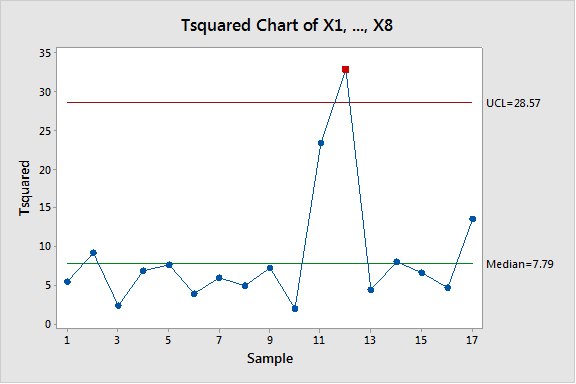 In Minitab, the T² Hotelling method is used to generate multivariate charts. If you don't already have Minitab and you'd like to try creating some of the charts I'm discussing, you can download the free 30-day trial. Analyzing process parameters jointly: Many process parameters are related to one another, for example, for a particular process step we might expect the pressure value to be large when temperature is high. Considering every process parameter separately is not necessarily a good option and might even be misleading. Detecting any mismatch between parameter settings may be very useful. 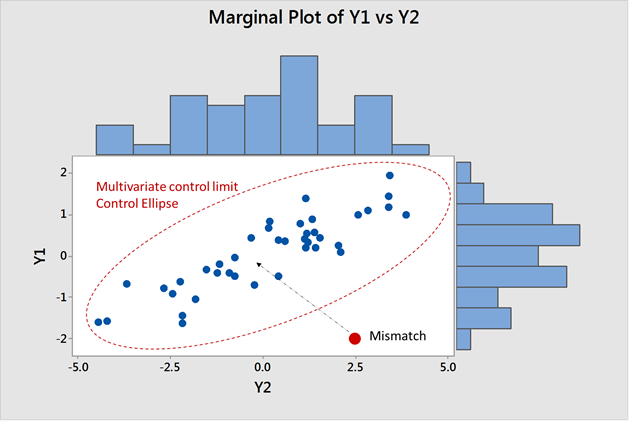 In the graph below, the Y1 and Y2 parameter values are correlated (high values for Y1 are associated with high values for Y2) so that the red point in the lower right corner appears to be out-of-control (beyond the control ellipse) from a multivariate point of view. 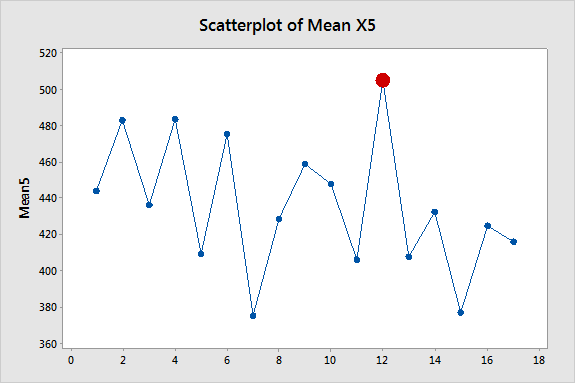 From a univariate perspective, this red point remains within the usual fluctuation bounds for both Y1 and Y2, though. This point clearly represents a mismatch between Y1 and Y2. 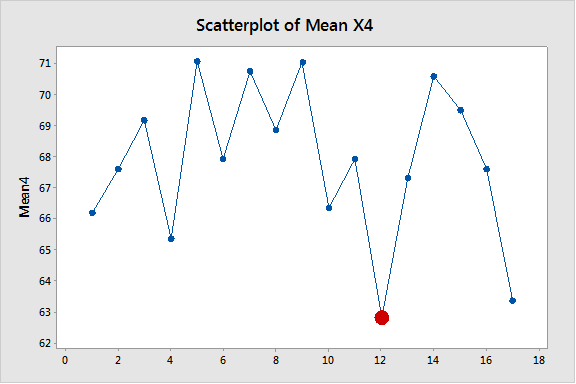 The squared generalized multivariate distance from the red point to the scatterplot mean is unusually large. Overall rate of false alarms: The probability of a false alarm with three-sigma standard limits in a control chart is 0,27%. If 100 charts are monitored at the same time, the probability of a false alarm automatically increases to 27% (0.27% * 100). However, when numerous variables are monitored simultaneously using a single multivariate chart, the overall/family rate of false alarms remains close to 0.27%. 3-D measurements: When three-dimensional measurements of a product are taken, the amount of data needed to ensure that all dimensions (X, Y and Z) remain within specifications can get pretty big. But if the product gets damaged in a particular area, it will usually affect more than one dimension, so the three dimensions should not be considered separately from one another. If a multivariate chart simultaneously monitors deviations from the ideal planned X, Y, Z values, their combined effects will be taken into account. 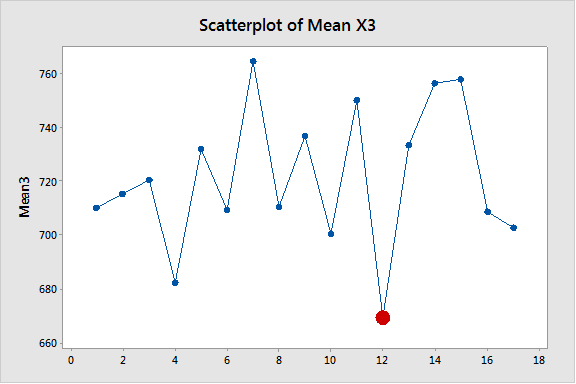 To investigate why an out-of-control point (subgroup 12) occurred in the multivariate chart, I used simple graphs (scatterplots) to analyze time trends. Note that as far as the X3, X4 and X5 parameters are involved, subgroup 12 is positioned far away from the other points. When process parameters have no direct critical effect, a dedicated univariate chart is not necessarily required. Multivariate charts enable you to routinely monitor many tool process parameters with fewer charts. 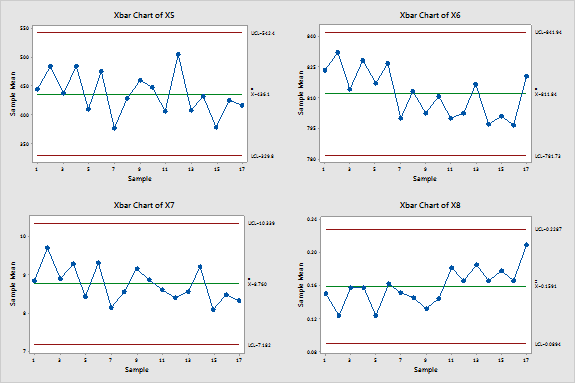 The objective would be to better understand whether out-of-control points in a multivariate chart may be used to anticipate quality issues as far as the product characteristics are concerned. To better control a process, we need to assess how upstream tool parameters affect the final product. Multivariate charts are also very useful to monitor 3-D measurements. Identifying the reason for an out-of-control point in a multivariate chart is a key aspect of using it successfully.